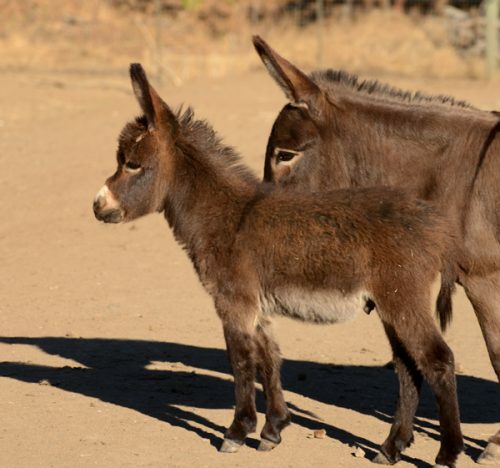 Our geldings sell for $1500-$1800 per donkey typically, and are only sold in pairs. I often have a waiting list. Geldings are so much fun!!!!! 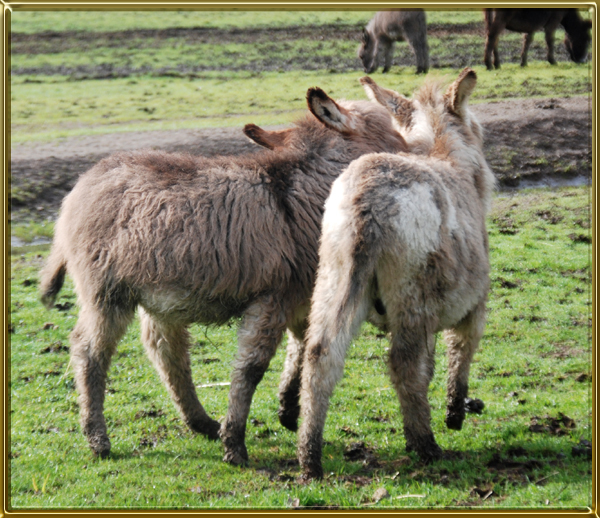 Two little geldings can be a reason to have donkeys at all – they are better than television!!! 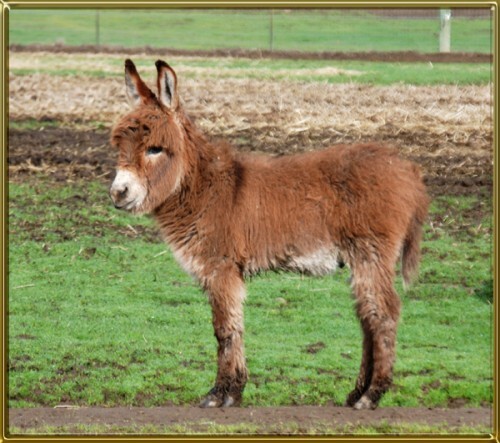 As with all my donkeys, I will not sell a gelding into a home without another Miniature Donkey. Usually my geldings sell as pairs. Having grown up together here from day one they are bonded friends for life when they leave me. Often these days they sell with a pair of Maremmas to guard them! That’s not required, by the way! But it does my heart good to see a bonded pair of donkeys with their bonded defenders from danger. The foals do love their dogs! 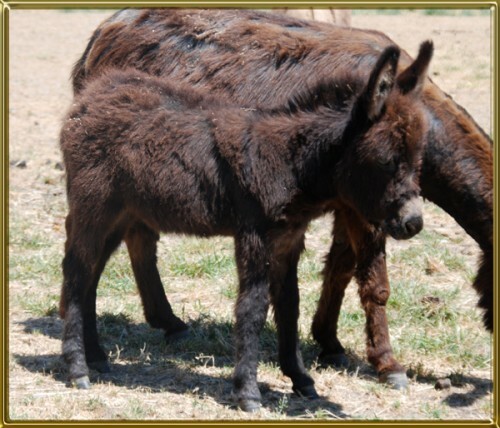 Here are Roko and Sam, pictured at about two months of age. 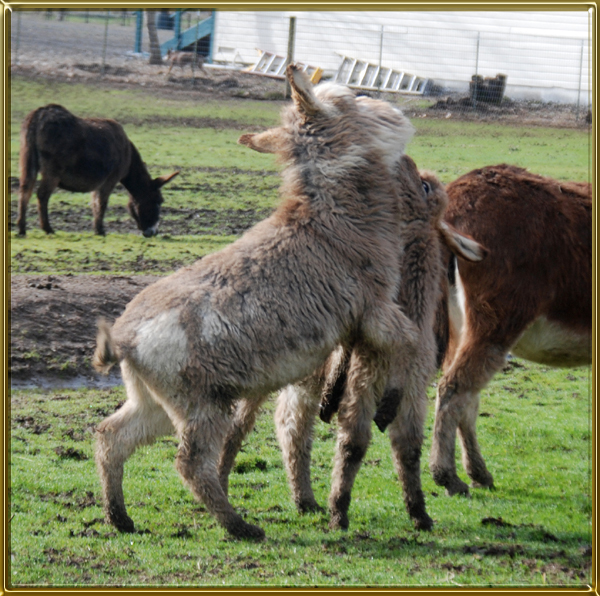 I was out in the field taking various donkey photos and these boys decided to put on a show for me. 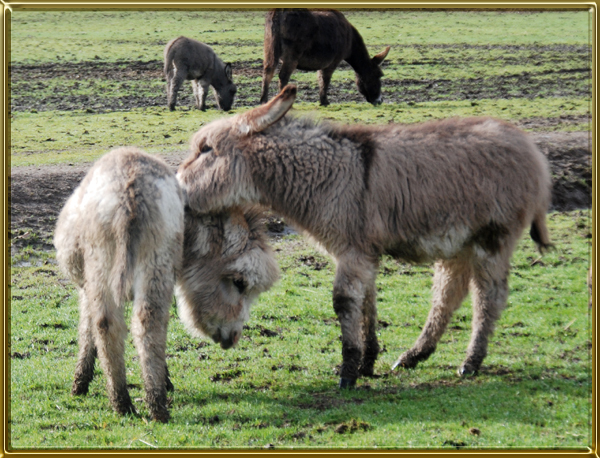 Prospective buyers sometimes question the need for two donkeys – these photos give good examples of why it matters. Roko and Sam play all day long, and this is typical of donkeys. These fellows are going to live in Valdez, Alaska as friends forever. Thank you Dale and Natasha for that! 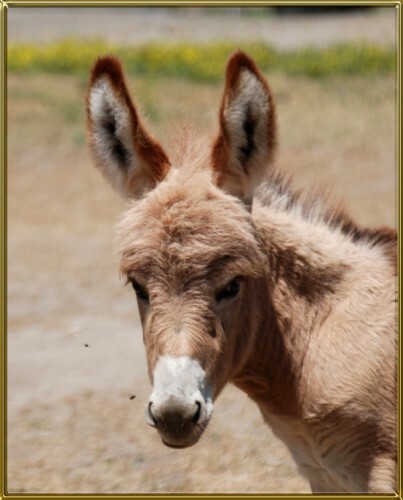 Notice in the photos that each donkey gives as well as he gets! 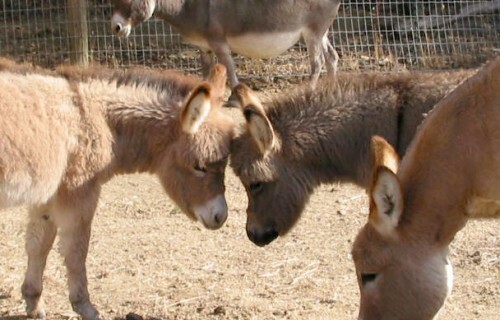 When donkeys play like this there isn’t one aggressive donkey and one submissive one. They are equal partners. It is absolutely delightful to watch!!!! 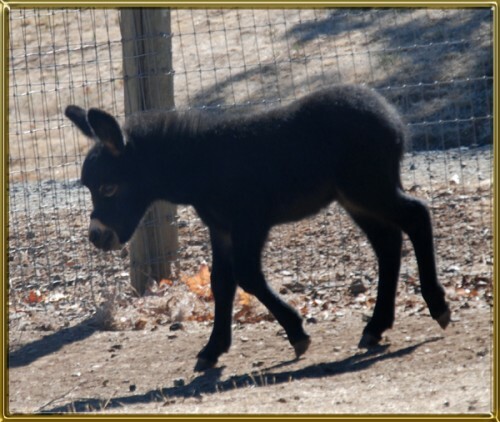 Zuni is a very cute little guy. 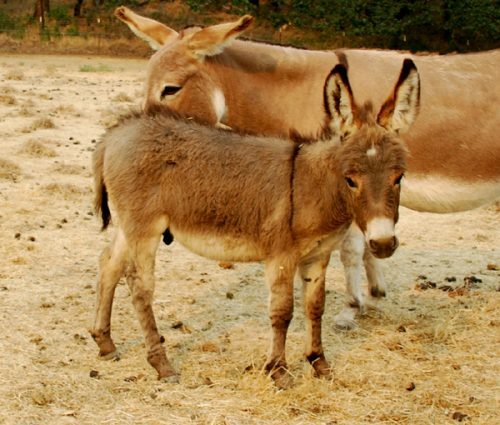 Unfortunately I don’t have another gelding-to-be foal to partner him with, and I don’t sell single donkeys, so Zuni will probably be here until later Summer or longer. 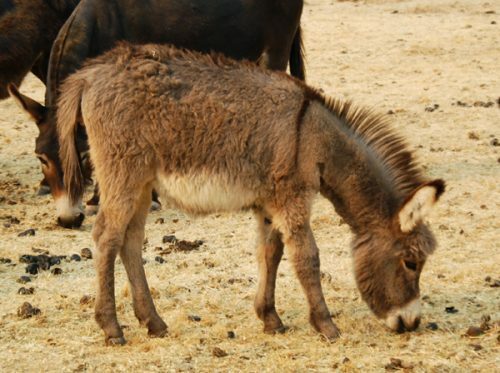 My next foals aren’t due until June 2019. Zuni will leave when his partner is at least 5 months old. Kirby will be sold with Santana only. Santana will be sold with Kirby only. Bar Code has been sold with Bandera. Bandera has been sold with Bar Code. 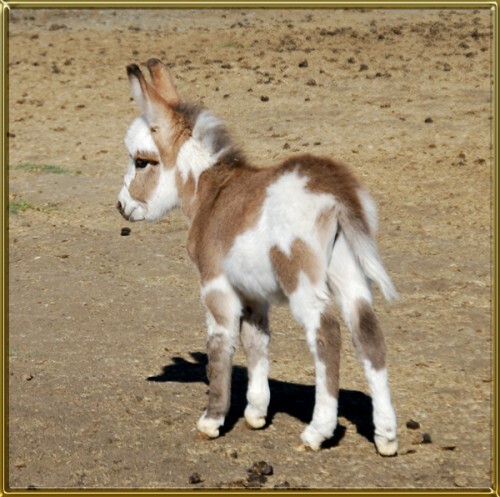 This little fellow is such an interesting color and has unusual markings. He’s got a small spot on his left side, out in the middle of lots of solid color. A friend of mine took to calling him Dot Com and the name stuck. 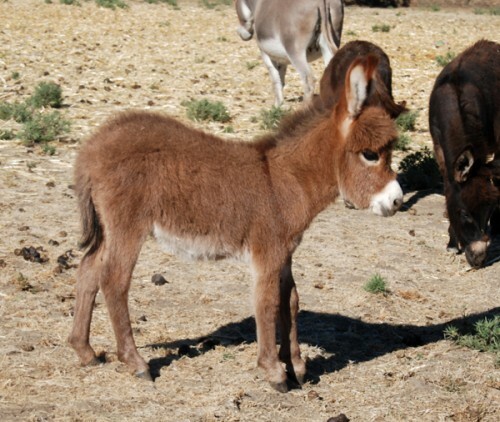 He’s a sweet foal. This bright eyed fellow has HUGE ears. His face is so expressive. 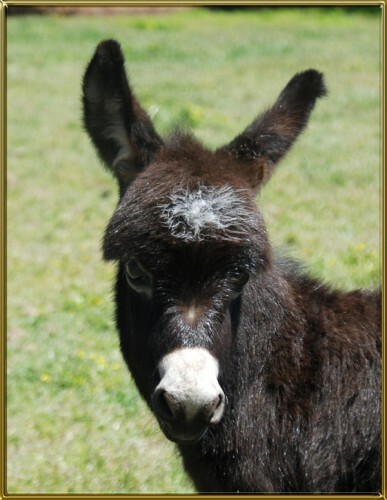 He’s a very handsome foal. 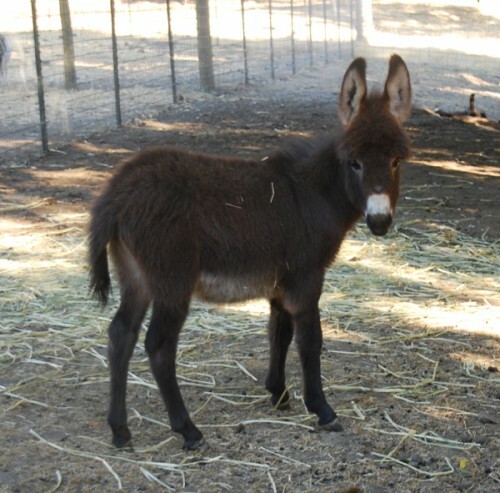 As with all our donkeys, he must go into a home with another Miniature Donkey. 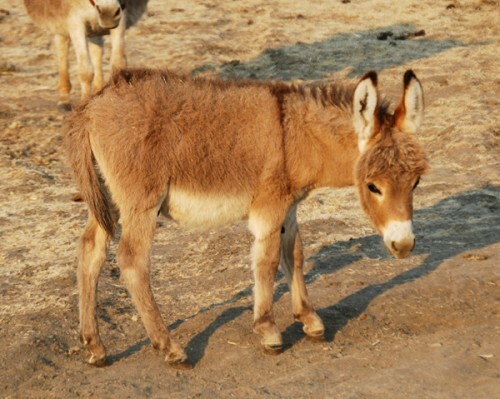 The geldings are usually paired here as foals. Zeus would be a good partner with Avalon. 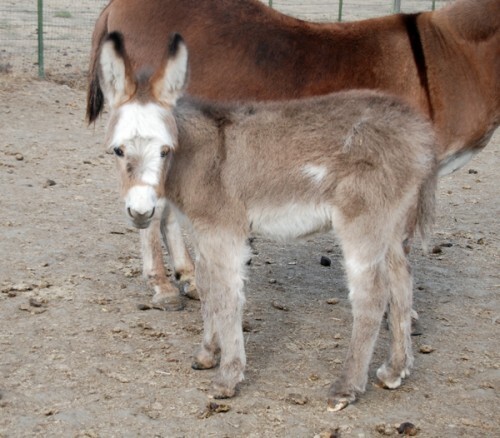 This foal is gorgeous! He has huge ears and huge dark, expressive eyes. And he’s a sweetheart. Avalon is a fancy boy!!! 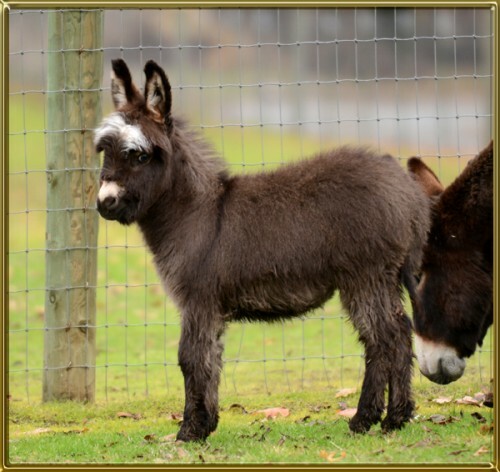 As with all our donkeys, he must go into a home with another Miniature Donkey. 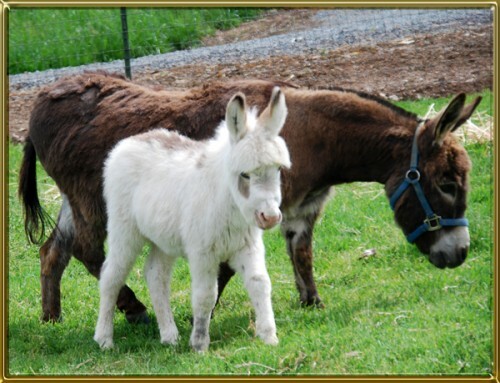 The geldings are usually paired here as foals. Avalon would be a good partner with Zeus. Top Shelf is a very special little guy in every way. He is small and compact. 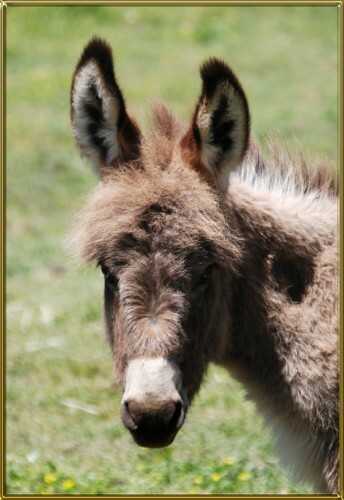 His short, broad, dishy head has tons of character. He has lots of bone, a short back, and friendly, gentle presence. He’s a favorite for sure. Rustler is a cutie! 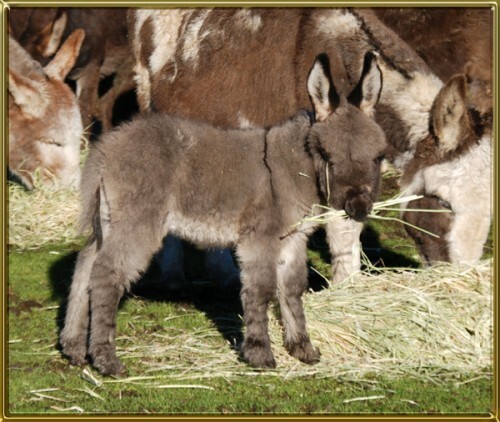 As with all our donkeys, he must go into a home with another Miniature Donkey. 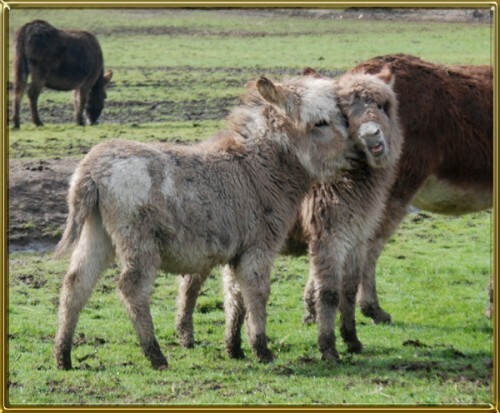 The geldings are usually paired here as foals. Rustler would be a good partner with any of the other geldings listed. 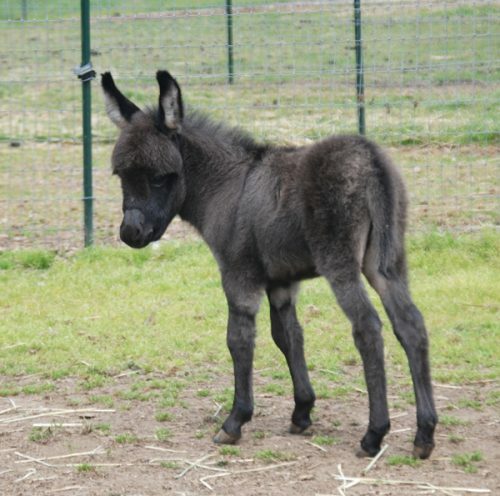 This foal is beautiful! I’m looking forward to watching him mature. 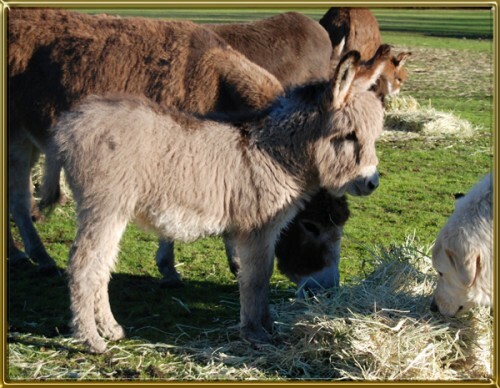 As with all our donkeys, he must go into a home with another Miniature Donkey. 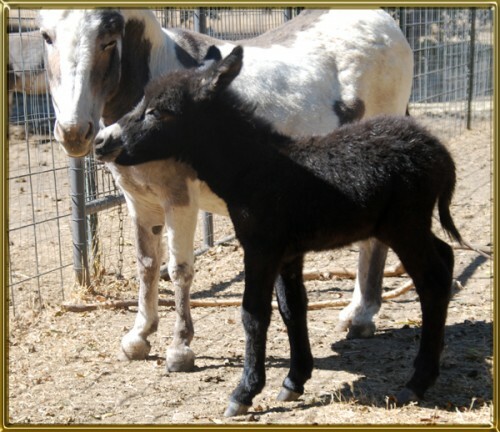 The geldings are usually paired here as foals. Galaxy would be a good partner with any of the other geldings listed. 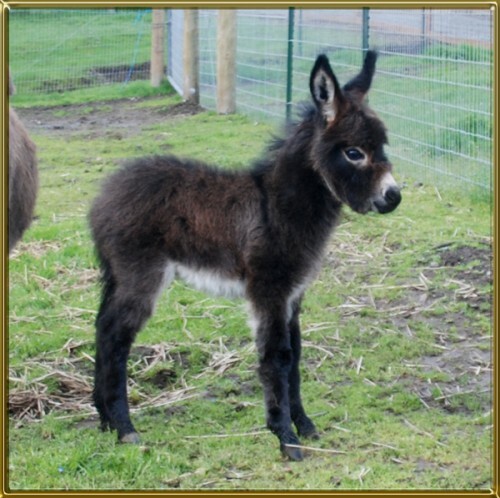 Kaiden must go into a home with another Miniature Donkey. This photo was taken 5/18/17 when Kaiden was three months old. I’ll add photos and more information soon. 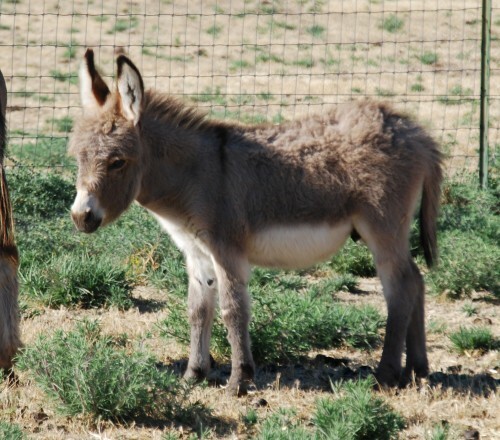 He must go into a home with another Miniature Donkey gelding. Pele’ is a long legged, feisty fellow. 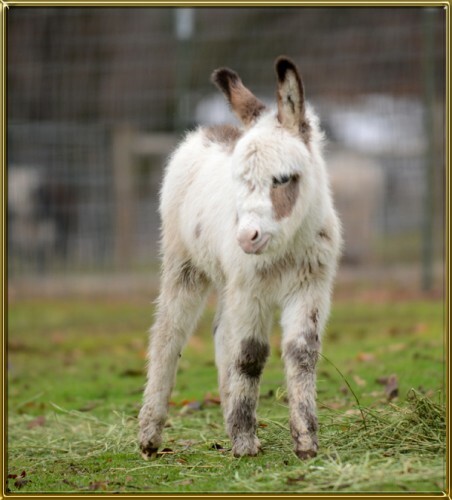 He’s quite the athletic type – hence his name! This photo was taken March 2017. Notice that he now has a dark nose! Zeppelin is really special. He is lots of fun! This little guy has spark! 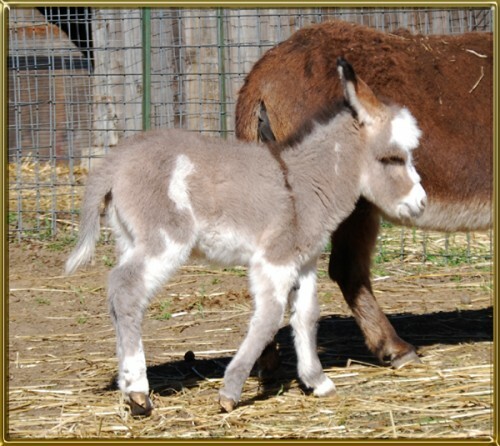 He races circles around his poor mom. 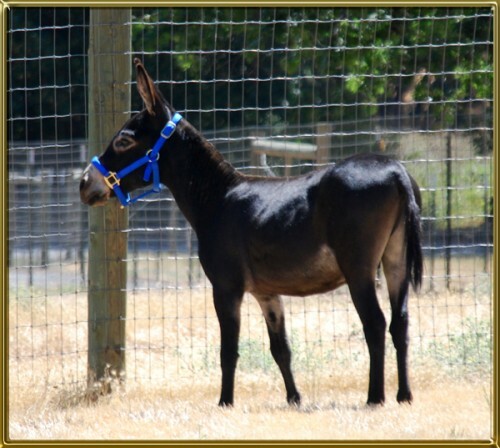 He is very confident and friendly with people and is a ranch favorite. This little guy is adorable! He would be a wonderful partner with Shiner. Shiner is thusly named because of the grey under both his eyes. If he were a person it might make you wonder if he had had two black eyes! This friendly fellow is almost completely white; his markings are quite unique. This photo was taken 12-5-16. Picasso with go with his best friend Raven to Don and Connie Brock in California. Thank you! My lovely Raven with go with his best friend Picasso to Don and Connie Brock in California. Thank you! This little guy is so charismatic! 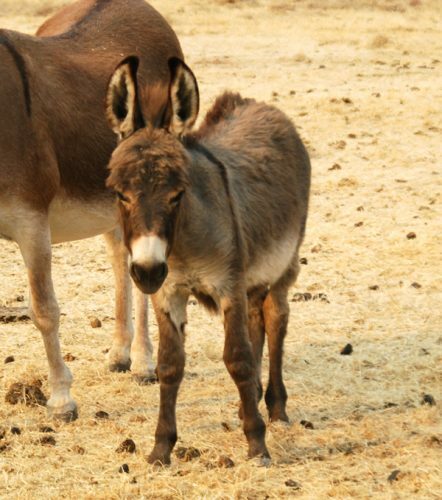 He’s very sweet, and adventuresome, and is always a quick favorite with visitors. I enjoy watching him seek out and snuggle with his guardian dogs. Sometimes he is quite the pest for them I am sure! This beautiful oh so friendly fellow has been sold to Rodney and Treasa Anderson with his friend Oliver. Thank you! This sweet fellow has been sold, and will live with his friend Kole in Grants Pass, OR. Thank you Rodney and Treasa Anderson! Savoy is a cutie! He will be a fun gelding for some lucky person! 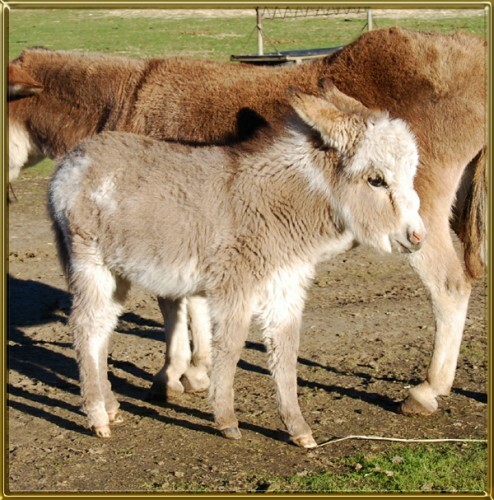 The spotted donkey in the photo below is BR Pepper Jack, Savoy’s sire. The dark jennet is MGF Malina, Savoy’s dam. Roko and Sam are headed to Valdez, Alaska! This little guy is tough to take a good photo of! He has so much hair on his face that it’s hard to find his eyes under there! Sam and his best friend Roko are headed to Valdez, Alaska!!! Cajun is a tall, leggy fellow! He has a great attitude! He’ll be a fun friend. 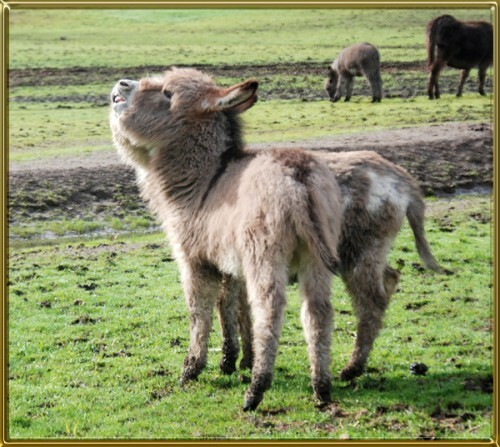 This is Cajun saying he wants to be a performance donkey when he grows up!!!! 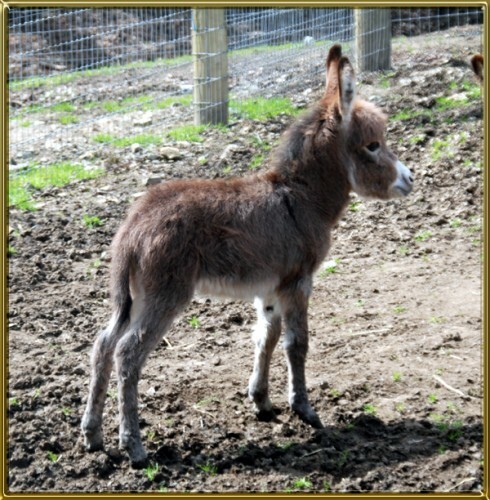 TC is an exceptionally beautiful foal! He’s eye candy for sure! 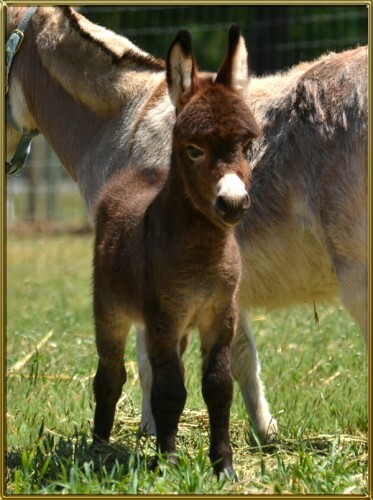 What a fancy, friendly foal Gatsby is! 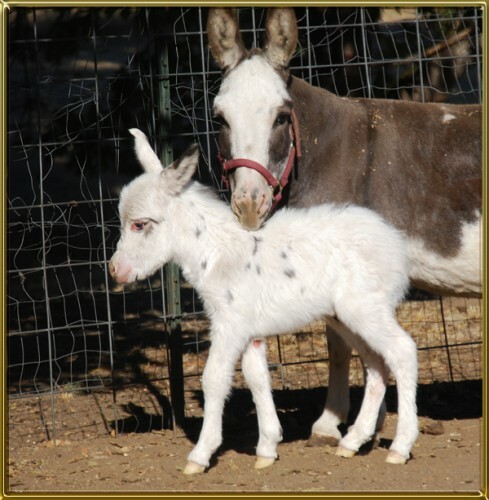 Taffy has the most beautiful foals! My lovely Gatsby has been sold to Jacob Smith and will be a companion to his young herd sire, BR Essex. That’s quite an important job for Gatsby, and I thank Jacob for thinking enough of Essex to give him a friend. 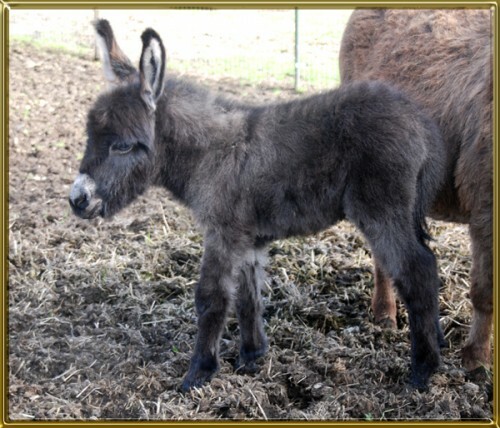 This little cutie sold quickly, which is a good thing because I was becoming particularly fond of him! He and Zenith will be great life partners. 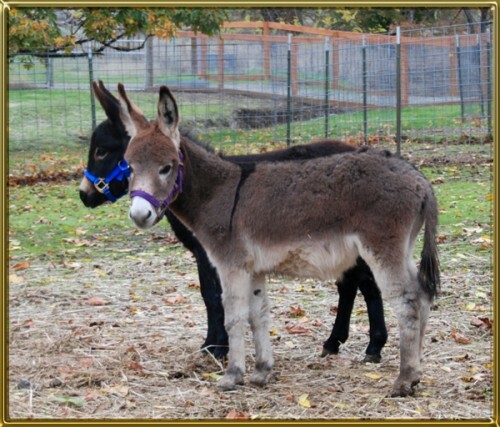 Thank you Francie for your purchase of Max and Zenith! Zenith is a drafty, compact little fellow with TONS of charisma! He’s quickly become a favorite of mine. Hijinks is an absolutely gorgeous gelding. He really is stunning. 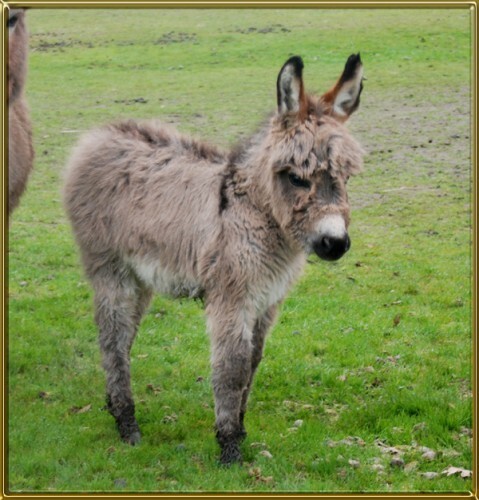 He could be quite the fancy cart donkey I would think! Hijinks is a sweet, somewhat sensitive fellow and is looking for a gentle home. My lovely Hijinks has found a new home with my good friend Nancy White of Emmett, Idaho. Thanks you!!! !